WriteRoom is founded on a great idea that is hard to find nowadays in the computing world, a distraction free workspace that emphasizes nothing but the task at hand. In this case, the task is writing, which WriteRoom allows you to do easily. There are few frills other than what you absolutely must need to write, so don’t expect Microsoft Word. 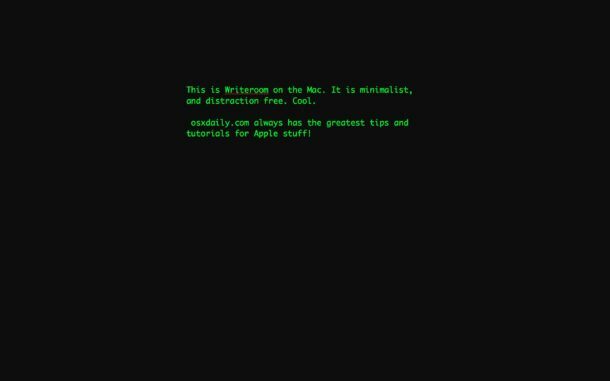 The WriteRoom workspace is attractively presented in a simple retro green on black terminal-like appearance, although you can change the color scheme to whatever you want. Check out the screenshot below. Besides the color scheme, you can also customize the width and height of the writing space, so if you prefer the genuine full screen console appearance it’s just a matter of setting the workspace to the width of your display. The latest version of WriteRoom is really cool with a lot of great features but we are actually going to suggest WriteRoom 1.0, because it is free to download. Yes the features are more basic, but if your core need is to write in a distraction free space, 1.0 does the job just just fine. If you’re looking for fancier text editor features and don’t mind shelling out $25, get the newest version (currently 2.3.7). You can try it out for 30 days for free. Note: If you like the idea of a distraction free workspace for other applications and not just writing, check out Think. There is another free Editor, which started out as a toy proof-of-concept Java implementation of WriteRoom: JDarkRoom (http://www.codealchemists.com/jdarkroom/). It should run under Mac OS X, Linux and Windows. To run JDarkRoom, you need to have Java 1.4 or greater installed. Mac OS X comes pre-loaded with Java so you don’t need to worry. Is this available for my PC? I want to write in a big writing spot. So I can write any thing I want in that big writing spot.